This transmitter is modified by Team BlackSheep to support lower voltage input voltage and at the same time boost your output power. The new supported input power is 6.6 to 12.6V. The voltage is no longer proportional to the output power. It also removes a component that has seen failures which would reduce the output power to a fraction of what is normal. 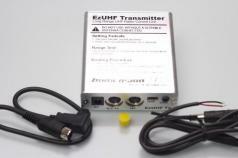 This maximizes the reliability of your EzUHF Tx. Warning: The modification impairs the bi-directional functionality (which is not being used currently).